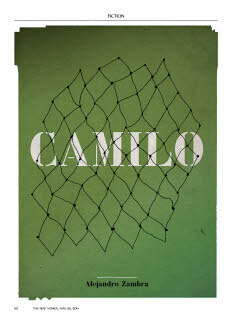 “I’m Camilo!” he shouted to me from the gate, opening his arms wide, as if we knew each other. “Your daddy’s godson.” It seemed terribly suspicious to me, like a caricature of danger, and I was nine then, already too big to fall for a trap like that. Those dark glasses, like a blind man’s, on a cloudy day. And that jean jacket, covered in sewn-on patches with the names of rock bands. “My dad’s not here,” I told him, closing the door, and I didn’t even give my father the message; I forgot. But it turned out to be true: my father had been a close friend of Camilo’s father, Big Camilo—they’d played soccer together on the Renca team. We had photographs of the baptism, the baby crying and the adults looking solemnly into the camera. All was well for several years—my father was an engaged godfather, and he took an interest in the child—but then he and Big Camilo had a fight, and later, some months after the coup, Big Camilo was imprisoned, and after he was released he went into exile. The plan was for his wife, July, to bring Little Camilo and meet up with him in Paris, but she didn’t want to, and the marriage, in fact, ended. . . .